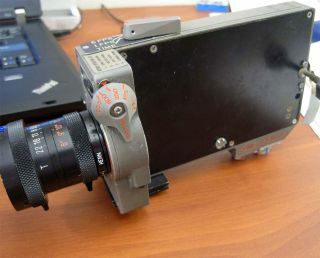 Apollo 14 lunar module pilot Edgar Mitchell will surrender this flown-to-the-moon 16-mm data acquisition camera to settle a federal lawsuit against him. Apollo astronaut Edgar Mitchell has decided to give up the camera he kept as a memento of his 1971 moon mission rather than face a federal lawsuit over its ownership. In a settlement he reached with the U.S. government filed with the District Court in southern Florida on Thursday (Oct. 27), the sixth man to walk on the moon agreed to "relinquish all claims of ownership, legal title, or dominion" over the data acquisition camera that flew with him aboard NASA's Apollo 14 mission. Mitchell agreed to allow Bonhams, the New York auction house where he had consigned the camera for sale last June, to release the artifact to the government. Bonhams had estimated the camera's value at $60,000 to $80,000. The 16-mm camera, which was one of two motion picture cameras on board the Apollo 14 lunar module "Antares" when it landed on the moon on Feb. 5, 1971, will be given within 60 days to the Smithsonian National Air and Space Museum in Washington, DC for display. According to the the terms of the settlement, which still needs to be signed off by a judge, Mitchell and the federal prosecutors will be responsible for their own legal fees. Earlier this month, MItchell lost his bid for the case to be dismissed after a judge ruled that Florida's statute of limitations did not apply and any determination if the government had abandoned or gifted the camera would need to be made in court. The camera shot the final five minutes of the Antares landing, as Mitchell's crewmate, commander Alan Shepard, piloted the spacecraft to a touchdown on the moon's Fra Mauro Highlands. After more than 33 hours on the surface, including two moonwalks and a couple of swings with a makeshift golf club, Shepard and Mitchell blasted off from the moon's surface with the camera still on board. The mission plan called for the DACs to be left in Antares to save weight aboard the command module "Kitty Hawk," the capsule that would return the two moonwalkers and pilot Stu Roosa to Earth. The lunar module and all its contents would be left to slam back onto the moon just a day later. Before parting ways with the lander though, Mitchell saved the DAC and, together with various other spacesuit and spacecraft hardware that he and Shepard chose to retain as mementos, returned it to Earth. Filed this past June, "United States of America vs. Edgar Mitchell" argued that Mitchell was not assigned clear title for the camera and that it was the "exclusive property of the United States." Mitchell countered that charge by referring to a practice within the 1970's astronaut office that allowed the Apollo astronauts to keep equipment that hadn't been intended to return from the moon so long as the items did not exceed weight limitations and were approved by management. In trying to have the suit dismissed, Mitchell also argued that the government had otherwise abandoned the camera when it directed for it to be left behind to impact the moon and be destroyed. Less than a month after the suit was filed, in a seemingly unrelated move, NASA released guidelines for protecting and preserving the Apollo hardware on the moon, including the crash sites of its lunar modules. The government never made clear what distinguished the camera from other Apollo-returned hardware that Mitchell and other moonwalkers kept and sold without any sort of legal challenge. Along with a number of other astronauts including James Lovell and Al Worden, MItchell has consigned other flown items to an upcoming Nov. 30 auction of space artifacts and memorabilia arranged by Heritage Galleries in Dallas, Texas. Mitchell's lots include American and international flags carried to the moon on Apollo 14. Follow collectSPACE on Facebook orTwitter @collectSPACE and editor Robert Pearlman @robertpearlman. Copyright 2011 collectSPACE.com. All rights reserved.